Canine Star Of “A Dog’s Way Home” Was Hand-Picked From A Tennessee Shelter – Animal Lovers Unite! The filmmakers of A Dog’s Way Home had two very specific requirements for their canine star. She had to be a Pit Bull mix as in the novel by W. Bruce Cameron, and she had to be a rescue pup. Cameron and his wife discovered the perfect pooch in a Tennessee shelter. Despite her rough start, 2-year-old Shelby had everything they were looking for to play the lead role of “Bella”. Shelby’s Hollywood rags-to-riches story began in a Tennessee landfill where she scrounged for food before being rescued and taken to a local no-kill shelter. Cameron says the pup seemed thrilled just to have steady meals and a roof over her head. Cameron instantly fell in love with her soulful eyes and outgoing personality. Dog trainer, Teresa Ann Miller was also on board with the choice after watching Shelby ace a number of basic training tests. The dog was intelligent, fearless, and eager to learn. “It was obvious after just an hour of working with her, this was going to be the dog,” Cameron said. From there it was on to Hollywood to live with Miller and begin her training. The movie follows “Bella” through a series of heroic and harrowing adventures as she tries to find her way home through the Colorado mountains. Shelby learned to dig, jump, knock over trash cans, and even slide down a playground slide in preparation for filming. In the wake of the controversial video of canine actor, Hercules in the 2017 film, A Dog’s Purpose, the filmmakers took extra precautions to ensure Shelby and her doggy double, Amber stayed safe on set. The cast and crew were also given three numbers to call anonymously if they suspected mistreatment. Although the cameras have stopped rolling, Shelby’s story is far from over. She was adopted by dog trainer, Debbie Pearl, and now serves as a therapy dog visiting hospitals and children with autism. Her soothing presence is a trait Shelby has in common with her movie character, Bella. In the film she is shown comforting veterans. A Dog’s Way Home premiers in theaters Friday January 11. You can also pick up Cameron’s latest book “Shelby’s Story: A Dog’s Way Home Tale” to learn more about the pup who went from junkyard stray to Hollywood star! 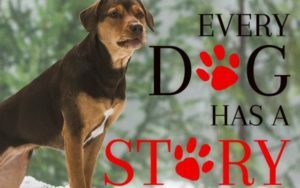 The post Canine Star Of “A Dog’s Way Home” Was Hand-Picked From A Tennessee Shelter appeared first on iHeartDogs.com.